» Home » Plan It! What do I want to express, explain, uncover, show or document? How might students use this resource? What do I expect to be the impact on learning? How will I know if this resource has made an impact on learning? Does a similar resource to the one I am envisioning already exist online somewhere? You may want to check Creative Commons licensed sources as well as resources in the Public Domain to start. Can you curate content by building some activities or context around a video that already exists or do you need to create something new? Here is an example of curated content around a YouTube video describing MOOCs. Can I do this by myself or will I need a team? What might my students need to know about copyright (if they are producing resources and publishing online)? Plan Your Project Worksheets:Video, Audio, Screencast: Guides to help you work out the learning objectives, content and associated learning activities. Will I be creating a mash-up with previously published content? (See section B of UBC's copyright guidelines). Will I be editing in any additional content to help me meet my objectives such as audio, music, video, or images? If so, I may want to review resources that are from the public domain or licensed as creative commons. Do I want to make it easy for people to republish or use my work with the appropriate attribution? If so, I may want to review the creative commons guide on the UBC Copyright site. Am I intending to publish student created content? If so, how will I handle permissions? Will I need to purchase equipment or can I borrow it? Can I do what I want to do with the equipment I have? What sort of permission(s) will I need to obtain (ie student permissions)? Will I incur any costs related to the use or maintenance of the tool I select? How much of an investment will I need to make to learn the tool or approach I have selected? Is there a return on investment of my time in learning this tool? Is this tool supported or maintained by UBC? If not, am I OK with that? Will I need to update the project ongoing? Will the tool or service I choose support that? If I am expecting students to use specific tools, what support will they need? What are the benefits to collaborating on, hosting or embedding my work in an open environment (ie YouTube, UBCBlogs, UBCWiki, Wikipedia, etc)? What are the risks? 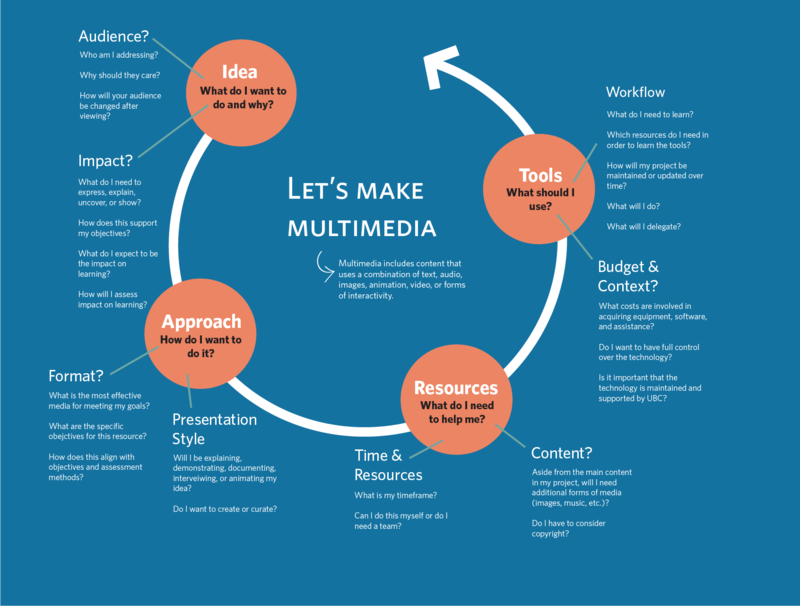 UBC's Design Principles for Multimedia. An overview of Mayer's principles (and Muller's research findings) for effective multimedia design within a practical framework. What Makes An Instructional Video Compelling? : Educause Review - 2014 Interesting piece looking at factors such as relationship to course content and conversational language as contributors to compelling viewing among students. Purdue's Instructors' Guide to Media Activities. Considerations for incorporating student created media projects in the classroom. Storyboard template (from Penn State Media Commons) along with storyboarding tips and examples. For storyboard pointers check out storyboarding for explainer videos by Common Craft. For scripting pointers look at Scripting for explainer videos by Lee Lefever at Common Craft. Image Sources: UBC's Copyright resource provides an excellent list of various "copyright safe" image databases and also includes some discipline specific ones as well. Creative Commons Guide: UBC's Copyright Guide provides lists of databases for free and "copyright safe" sounds, music and video for your digital media projects. It also helps you understand Creative Commons licenses and how and why you may want to apply one to your work. Public domain resources: this page provides an overview of what public domain is, how material in the public domain can be used, and much more, including quick tips to check if something is or is not considered public domain in Canada, as well as links to public domain sources. Why should I care about copyright? : this student-centered guide, put together by the UBC Learning Commons team, answers questions on the subject of copyright and addresses a number of myths and misconceptions surrounding copyright. Planning Worksheets: to help you work out your goals, and associated learning activities. Create notice of filming signs. Here is an example.